The search for exoplanets, or worlds orbiting other stars, is evolving so fast that discoveries that seemed exotic just a few months ago have become commonplace. Multiple-planet solar systems? Astronomers expected to find just a handful; now we know of more than 200. Planets orbiting double or even triple stars? It was big news when just one was announced back in September; we've already got several more examples in hand. In short, the unexpected is something planet hunters have learned to expect  and in most cases, these surprises have tended to expand the possibilities for finding worlds where life might thrive. It's just happened again: astronomers from the Carnegie Institution of Washington and the University of California, Santa Cruz, writing in the Astrophysical Journal Letters, have announced the discovery of yet another new world that defies everyone's expectations. Not only does the new planet orbit one of the suns in a triple-star system  rare enough in itself  but the stars in this system have surprisingly low levels of the heavy elements planets are made from. Theory suggests that such stars shouldn't form planets in the first place, so if this isn't a fluke, there may be many more planets in the Milky Way than anyone thought. 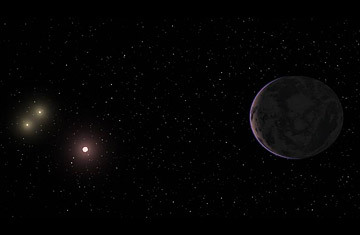 That's not all: the new planet, called GJ667Cc, is just 4.5 times Earth's mass. That's big enough to qualify it for the astronomical label "super-Earth" but still quite small by exoplanet standards. Indeed, it's so small that GJ667Cc is thought to be made of earthlike rock rather than gas  even if those rocks had to coalesce from a smaller supply of raw material circling the parent sun. Beyond that, it orbits in its star's habitable zone: if there's water there, that water could be in life-friendly liquid form. GJ667Cc whips around its star once every 28 days or so; in our solar system, that would put it so scorchingly close to the sun that water would boil off. But the star in this case is an M-dwarf, much dimmer and redder than our own. Given its mass and its temperature, says co-discoverer Steve Vogt, of UC Santa Cruz, "I think it's going to be pretty historic. We've been gnawing at the bone of an earthlike planet in the habitable zone for years now, and I think we're just about there." Actually, this isn't the first time he's said something like that. A bit over a year ago, Vogt and Paul Butler, of Carnegie, announced a similarly earthlike planet they called Gliese 581g, but other astronomers were (and remain) dubious about the legitimacy of the find. "We haven't backed off," says Vogt, "but that one will always be controversial, because it's a difficult measurement." This one, he says, is a much more clear-cut case. Along with Butler, lead author Guillem Anglada-Escudé (now at the University of Göttingen, in Germany) and several others, Vogt combined data from three different ground-based telescopes, dating back 10 years, to come up with the solid signal of a planet. "We were basically able to say, stick a fork in this one and put it in a referred journal  it's done." What's most exciting of all about GJ667Cc, though, is not just that it's a super-Earth in its star's habitable zone, nor that it was found in a solar system where planets have no right to be. It's that this new world is impressively close to our own Earth. The great majority of exoplanets known to date have been found by the Kepler space probe, but most of these are hundreds of light-years away. That's much too far away to search for even indirect signs of alien life  and that will continue to be true after the James Webb Space Telescope, Hubble's successor, launches in 2018. But GJ667Cc is a mere 22 light-years away  practically next door  and while the planet can't be seen directly yet, it's not impossible that the next generation of ground or space telescopes could take readings of its atmosphere to look for telltale signs of life. And we have the technology today, says Vogt, "to send a Droid cell phone out there to take closeup images. It would take about 200 years, plus another 20 to send the pictures back." Nobody's actually planning to do that, but the fact that it's even possible speaks volumes about how close astronomers are to finding and studying places in the universe where life might be thriving at this very moment. In the world of exoplanet science, the improbable things don't seem to stay improbable for very long. Watch TIME's video "Mars Rover Opportunity Celebrates Its Eighth Birthday."